Welcome to Portland! Our lovely city has many nicknames but the main two are Bridgetown and Rose City. A brief tour around town will show you why! 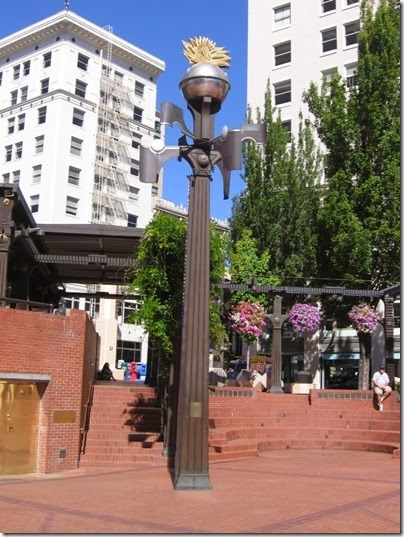 The star of the city has to be the statue of Portlandia, installed in 1985 above the west entrance of the Portland Building (1120 SW 5th Ave). The huge statue is the 2nd-largest copper repoussé statue in the world after the Statue of Liberty. The easiest way to get there is to take the southbound MAX to SW Jefferson and SW 5th Ave. For the best view, cross the street to the Standard Plaza Building and ride the elevator up one floor. The statue is based on the seal of the city of Portland, and both the architect Michael Graves and the sculptor Raymond Kaskey won awards for the Portland Building and its "Copper Goddess", respectively. No images of Portlandia may be used for monetary gain. The most striking features of the U.S. Bancorp Tower, affectionately referred to by the locals as "Big Pink", are its unusual shape and color. Because of the street grid, the tower features no right angles in its footprint, which makes it look either very slender or rather wide depending upon your viewing angle. The pink granite covering the building was quarried in Spain, and the glass used for the windows is also pink when viewed from outside because of its semi-transparent coating of copper and silver. Both the windows and the surrounding granite may appear darker or lighter depending upon the time of day. Also known as Portland's living room, Pioneer Square is a public space occupying a full 40,000-square-foot city block in the center of downtown Portland. 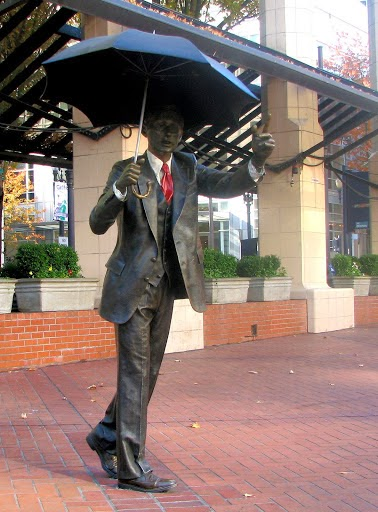 One of the more recognized pieces of public art in Portland is Seward Johnson's Allow Me, referred to by the locals as Umbrella Man. The bronze statue of a man in a business suit holding an umbrella is on the south side of the square, just above the amphitheater. an open-mouthed copper dragon, when storms are forecast. Dozens of all-ages events are held at the square each year, including free shows during spring and summer sponsored by local businesses. In 2006, the square was the site of an all-city pillow fight, and later an all-city slumber party. Pioneer Courthouse Square is also a venue for speeches, political demonstrations, rallies and vigils. On your visit to the Square, check out the paving bricks—they bear the names of the donors who contributed to the remodel of the site. Powell's Books is a chain of bookstores in Portland, Oregon and the surrounding metropolitan area. Powell's headquarters, dubbed Powell's City of Books, claims to be the largest independent new and used bookstore in the world. It is located in the Pearl District on the edge of downtown, where it occupies a full city block between NW 10th and 11th Avenues and between W Burnside and NW Couch Streets (Couch is pronounced "Cooch", by the way). It contains over 68,000 square feet (about 1.6 acres) of retail floor space. According to Wikipedia, CNN rates it one of the ten "coolest" bookstores in the world. The inventory for its retail and online sales is over four million new, used, rare, and out-of-print books. Powell's buys around 3,000 used books a day. They also have a coffee shop! Want to take a stroll down the riverfront while you are here? Then you should visit Waterfront Park! Governor Tom McCall Waterfront Park is a 36.59-acre park located in downtown Portland, Oregon, along the Willamette River. It is currently home to the Waterfront Blues Festival, Oregon Brewers Festival, Gay/Lesbian Pride Festival, and the Bite of Oregon festival. The park is also the host of many Rose Festival events. Speaking of the Rose festival, it starts around Memorial Day weekend, so you might catch a little of it if you try! While you are at Waterfront Park, don't forget to check out our famous Saturday Market! Founded in 1974, Portland Saturday Market is located in Waterfront Park and Ankeny Plaza in Portland's historic Old Town. The Market is one of the most popular tourist attractions in Portland, drawing an estimated one million people and generating annual sales of around $10 million. Everything at the Market is handcrafted by the vendors and is sold by the person who made it. The Market offers a unique opportunity for customers to meet the artists and often to see the pieces being made right in the booths. The Portland Saturday Market's hours are Saturday from 10:00am to 5:00pm and Sunday from 11:00 to 4:30pm. Admission is free, and the food is amazing! Guests of The Airport Sheraton can take the free hotel shuttle to Cascade Station, which features over a dozen specialty eateries and restaurants including: Buffalo Wild Wings, Panda Express, Famous Dave's BBQ, Red Robin, Starbucks, Jersey Mike's Subs and ParkStone Wood Kitchen + Taps. The shuttle can also take you to the Super Target for your shopping needs, as well as to the light rail station at the airport. From the airport you can take the Max/Tri-Met to anywhere you wanna go! For maps and schedules regarding our fine public transportation, please check out their website at trimet.org, or dial 503-238-RIDE (7433).